Backed By More Than 14 Years of Franchise Experience! The percentage of Americans receiving massage has more than doubled from 8% to 21% since 1997. The percentage of Americans receiving massage from 04'-05'increased by 4%. A skyrocketing industry, consumers now spend between $6 and $11 billion annually on massage therapy. With upscale facilities that appeal to both male and female clients, staffed with professional massage therapists offering a variety of massage styles, Elements Therapeutic Massage franchises offer a total wellness approach providing feedback to clients to encourage repeat visits and professional image. 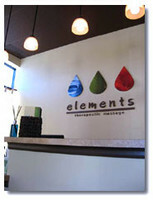 Elements also offers retail items for sale to enhance exposure and profits, as well as a variety of pricing structures and memberships available for clients. Little extras such as bottled water and mints add perceived value at very little cost. Cultivate referrals from Chiropractors, PT's and FT owners etc. Training and support implemented by experienced massage therapists.